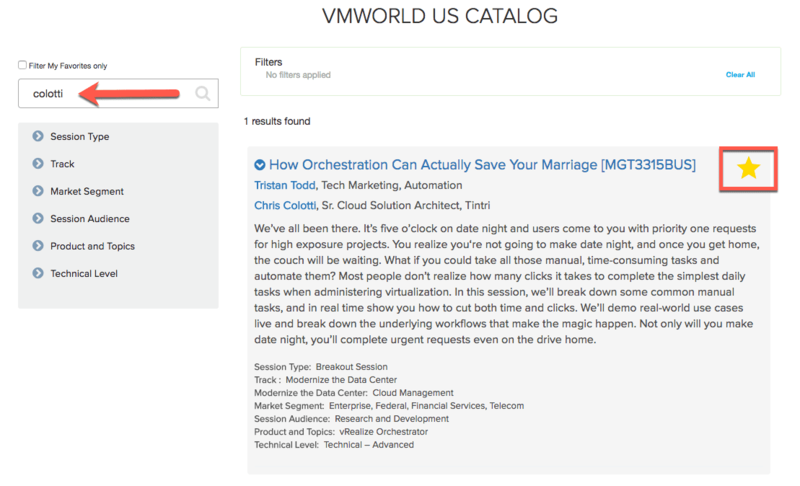 Most people know by now that the VMworld 2017 Content Catalog is live. Those that are VMworld veterans know the tricks to find the sessions they want to register for before the session builder opens up. Seeing as Tristan Todd and I have one session there year, here is the easiest way to find, save, and ultimately register for ours once you can. We want to fill this session mostly because it’s going to be good information, but also it’s just going to be a lot of fun for us to present as well as for attendees to listen to and get engaged in. After presenting at over 8 VMworld conferences this one session will probably be the most fun so take note! Easiest way to find any session you want is to just search by last name. Less is more in most cases. So if you just search for ‘Colotti’ you will find our straight away. Once you find the session by name you can select the “Favorites” star so you can find it later. To find all your sessions later so you can quickly register for them just filter by your favorites only. Tristan and I hope to see many of you there for something different and fun!